This wickedly inventive guide shows you how to program, build, and debug a variety of PICAXE microcontroller projects. 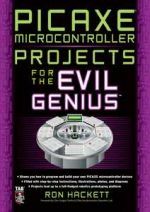 PICAXE Microcontroller Projects for the Evil Genius gets you started with programming and I/O interfacing right away, and then shows you how to develop a master processor circuit. From "Hello, World!" to "Hail, Octavius!" All the projects in Part I can be accomplished using either an M or M2 class PICAXE processor, and Part II adds 20X2-based master processor projects to the mix. Part III culminates in the creation of Octavius--a sophisticated robotics experimentation platform featuring a 40X2 master processor and eight breadboard stations which allow you to develop intelligent peripherals to augment Octavius' functioning. The only limit is your imagination! Visit www.JRHackett.net to learn more.